After a wait here is my next template release,and the release is really fast and good as my friend ritesh and me made this template together.So you will be eager to see my this blogger template.It is an chucky blogger template,the wordpress theme from topwpthemes. As the special feature in this for you is the featured galley which many readers like to use and a automate shortening of post section on home page which is the speciality of wordpress themes.So what you waiting for, just have an demo and download it and start using it as soon as you can. Now if you think this template doesn’t satisfy your dream design,then check out my last two designs for sure as may like it for sure. I request you to Please Back Up your blogger template and all blogger widgets to your desktop or just copy paste all sidebar widgets codes to notepad and save to your desktop for further use in new template. When you will Download This Template you will get an installation guide downloaded with template but i would like to tell about installation here too. 1) Header Image:-Just upload your header image from header widget inside the blogger layout.That is widget at top left of page elements,by hitting Edit Button.If you donâ€™t wanna use image,you can use text also. 2) Menu Links:-To add the menu links, just keep on publishing your blogger pages and links will be added there automatically. 3) Read More Hack With Thumbnail:-As read more hack with thumbnail is installed.And it display image of size i assigned on homepage.If you want to change it or remove it or any alterations in it,you can read and modify it from here. a) You will see the Featured Content widget in the layout above in picture as i shown where it is. b) Just Add the Following Content in the way to make it work. c) You have to just change the things highlighted in red color. e) Repeat The step and Get as much post you want. I have seen many having problem in adding this slider.So i am ading one more way for you to add it correctly.Just open this notepad file and copy codes from it and paste it in the widget of slider and save it.These are codes which i am using in demo blog.If it works perfectly then just edit content in that codes in the way i have told above. If You Really liked my work and want encourage me to convert more Proffessional wordpress themes to blogger templates for Free, Then please help us by donating something you feel for this design and dont forget to read my friend article on how businesses manage a social media crisis. nice work! Is it for free? It's gorgeous. I wish I could make it work with my blog, it's so organized. hellow, this template Rock !!! but i dont know how to put ads beside and below of article? Just use third one data:post.body to place adds in this template above it and down. 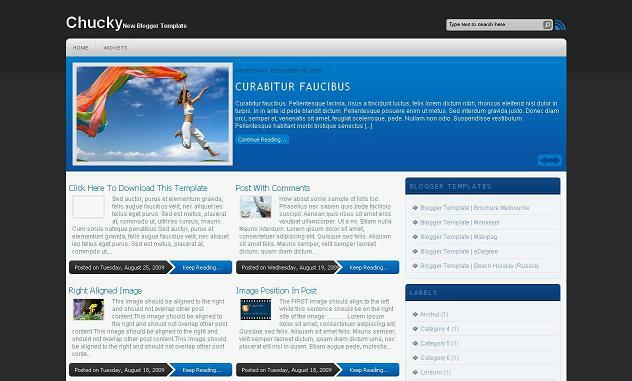 @anuj Thanx for reviewing.Will soon relese some more best templates than these. Would you like to show some little? The Post Bar is great. There are many Post performed there… The main bar has 2 columns. How to do it? Just define two diff css for one for main page and one for post page.Like in my template check for .post and .single and then expand codes and check how i have defined them in between. This is a cool template but when you have just a video and no text as a blogpost how will it look? @y2design sorry friend its too difficult to design these templaes compatible with ie6 as its the 9 year old version created that don't support many css properties, we are now making templates only compatible with ie7.As soon this ie6 will be dumped.Don't worry only 5-10 percent of visitors will be using this browser,as it doesn't open blogs of todays trend. And you even removed footer cedits thats too bad. I'm trying to use it on my blog but I can't make work the featured content script. I followed all your instructions. @anthony please try implemnting it carefully ,bcz sometimes you are doing mistake and seems we are right that happens many times even with us too. Thanks for a great template – like Anthony I can't make the pictures appear on the Featured Posts widget. Could you possibly help please? I've tried putting in lots of different online picture URLs as addresses but it doesn't want to work. Just the matter is not changing picture or links,just thing is to get right the method first and then after it you can change post tiel and sescription. To make convinient i am giving you now link in my post read it again .And the link contains all codes which i have addd in my blog.Just add them directly and check if it works or not.If it get worked just chnage the picture and links with yours i think that could get more easy for those who are not able to implement it. Hi, thanks for the response. Now I could make it work fine. I was adding the code in the wrong place. Beth, try to write here the code you're using on the Featured Content hack so maybe we can check it and see what's wrong. Hi, thanks for you help Arshul and Anthony. Here's the code I'm using – I've tried recopying it several times from your site and everything else is working apart from the image link (the image title shows up in the grey image box, and the post title, description, date, and 'continue reading' link all work). So what I've done is opened the HTML gadget box as shown, and literally pasted the HTML above into it, adding text where text is required, and website URLs in the image "src=" box and the "ahref" box for the actual article. It won't let me publish HTML in this box, so I can't give you the actual details, but can you think of anything that I would be doing wrong? Any tips would be very much appreciated! Hello, sorry – I went back to see exactly what Arshul did and it seems that to host pictures on Tinypic makes the featured posts work for me. So now I'll just host the pictures for the blog on there and everything should work! Thanks again for your help and for the great template! @andrew its not the reason as only on tinypc it will work,you might be using images link of blogspot that might would be creating problem bcz you would have been using in wrong way or say wrong link to image.bcz bloger creates two image link one is embeded and one is linked you might be using wrong one. The difference in links is only of using s-h00 and one is s400 in it.s400 linkwill work. it works in ie its tested…you sholud show the blog so that i can check it in ie what problem is coming …. but i m looking for a footer bellow and three boxes bellow my posting. Nice theme. Is there anyway I can move blogroll, label and blog archive to the bottom just like your "The-latest template" ? Hi Anshul … Great template, i have used it for my blog now but i have one hitch. My featured content loads slow and shows in a staggered format for couple of seconds before site loads completely. I tried to troubleshoot by looking at your code as it doesn't happen for you demo site but i couldn't figure it out. Can you help? @man you are trying to make three column its difficult to make in it unless you are are expert at it. @jashed it depends on the images you are using in slider and the which host are the scripts loaded to make slider work and how many featured posts you using. Script i have uploaded to blogger only.Just try uisng light images it will load fast. Your chucky theme is so amazing, i loves to use it. but now i facing one problems, somehow i cannot find the Title fill in column whenever i want to create a new post. Can you tell me how to fix it? Ok! Tryed with a diferent located picture and it didn't solved the problem. I really like this template. It not just amazing. It is a HIT. However I have had some complaints that on the post pages that the font is too small, and the contrast between the text colour and background colour (grey on grey) is difficult to read. I can't change these settings in the Blogger "fonts & colours" nor can I find the html code for it. I assume it is running off a link from your site. All the text seems to wordwrap and are removed from their formatting when it displays on the front page. The layout also does not work under Opera. I use Opera alot because it surfs much faster than my Firefox even with gazillion tabs open. Thanks for this template. It's great and works perfectly but for one detail. The search box only works for the most recent posts. I've checked even in your demo and it does not work correctly. Anshul, great work, I've been reading the comments and nobody seems to have my problem. If you look at my blog you'll see the 2 columns of the posts not aligned. Sorry if I can't explain it in a better way. Can you help me? Thanks in advance. Great template! I'm having some trouble with the menu links however. The menu bar doesn't show any of the links I add but instead shows the latter part of whatever text I put as the "title". I can show you the problem if you need. 2. I try to use email to Blog sevice ,The Blog doesn't show image .What wrong? Thanks. Can I change color to green from blue? Can you tell me some codes for green and where to change. @jimmy use this target='blank' to open different window and email to blog service is working fine. @bally you seem adding jaavascript at wrong widget.just check from layout image in my post where to add. @direct you have to chnage some color codes and also blue images with green ones to do it. but nothing change.I wanna add a good quote background image but I cannot .Do you have any solution? @sharavan its working fine i checked. @izdleva not able to see any type of social widget on your blog. @anonymous just apply .post-body blockquote it will work. If I could have it with 3 columns at the bottom like the 'life4business' template then this template would be perfect for me ! oh onw more thing how do I change the color from blue to some color else? but I can not see any changes. @eh-i just use .post-body blockquote instead of .post blockquote what i said. hey dude, thanks for your template. thnx fo tmplt az it chnged mah blog luk of indiawithme.blogspot.com …. @goes its just simple to add it from linklist in layout. @ajinkya Its all upon what type of desing you like or need for your blog.As i have beeen creating templaes for profffsional or design blogs till now not of any art or mums or kids.I just converted this as same as was in wordpress. hi admin, i have a problem with featured gallery..once i click older post, the featured gallery will gone..
@gallery have been set to show only on homepage not post page. if anybody open my post, over the post will show "Home > 'Labelname' > 'postname'"
@risk to me your blog is working perfect with gallery no problem in it. Hi, I have a huge problem that will affect me in seo. I love your theme, but it seems on my main page the word for my articles keeps extending, and I would want it so It is just a summary of the posts. NOtivce how my posts on the homepage keep going past the blue line witht he date and read more… PLease help. and just decrease the above values as text will shorten and not exceed to blue bar.Adjust values acc to your need. Thanks so much. And, sorry to bother you again, but is it possible for the image previews to be clickable to the blog spot, like when you click the title? @hyip we can link to blog post whole but if we try to do so the text with image also get linked so no way to link image only in it. Sorry or it. Awesome work,The design was just rocking .Good job dude. Hi I am wondering how to remove the read more hack. I am having huge problems. Please help! @ballyJ means you don't want this small post section on home page , to remove it you just need to change all codes for it,its difficult to tell bcz any coder can do that. hi, thanks for the awesome design. loving it! btw i'm having a slight problem, the "posted on" only shows the posted time, instead of date, how to change it? like from "posted on 00:00 AM" to "posted on 2010.01.01"
@k1dy just change date format and time format in settigns. Hello, I use your template and I love it, congratulations! The only problem I have is that I can not increase the size of the titles of the posts once you open the page, ie, once you select the home owner. How can I do? Thank you. I already manage to solve it. Hey Anshul, thanks for this amazing comment. I've got one problem with it though: How do I change the default RSS link of the RSS button next to the search box, and the default RSS link next to the "Subscribe to" texts? Any help on how I can change those default feed links to my FeedBurner links would be great. @ice find below codes and chnage with your link. And keep remain subscribe text as it is. I couldn't find the code you gave in the theme. I tried find feature for that code as well, but find didn't find anything. What to do now? Hi, Your template works great! However, if i want to add more link in the link list", it can only display at most 3 or more links. Is there anyway i can do to make it able to display more links under the link list? How to do i make it to a cascade horizontal navigation menu? @jack no u can use these much only not below them. For cascading as you can use them in widget as i have provided you linklist widget to add links. So make them you need to add the link independently in place of hat widget and also have to chnage the css for that menu. @Anshul Thanks for your reply. However, i don't really know how to do it as i'm pretty new to this. As my blog site has a lot of links and if i don't create cascading horizontal menu, i will not be able to display them. Don't mind if you could explain a bit more in details or how can i work on it. @jack you can do only if you know css you are new then will not be able to do it.As its designing. First i want of course to thank you for the great template you gave us access to. I somehow adapted it for a blog, but i cannot make it display more than 11 posts on the main page. I tried to set it up from the blog settings, but it has no consequence on the blog it seems. @ciprian no such problem in template i tested it in my blog. i can not to change next featured. what should i do? where is another link/place i can download? thanks so much. Hey Anshul, I was just wondering which part should I be editing so that the read more opens up in a pop up window instead of leaving the main page and all. @fuyu just read it first as its installed in it. between it will be defined link just add target='blank' in it. However, I don't understand why the two first posts I did are not parralel, the first one is slightly higher than the second one. Can you advise. Thx a lot. My only issue is that the posts are not parralel. Hi, can you give me tips to make the main content wrapper load first, as my blog has to load a long time before my white background loads. I want it to load first with the background black, so my grey background loads sooner. @ov3r just remove date option from the post.and cant help in loading first any part.Just can say if you load script to your host may become loading fast and remove other useless widgets in your sidebar and footer. @admin just remove all scripts and upload the js files whch you get wth download to your server and just place the scripts links in codes. Hi, can you give me a site to upload so I can upload my javascipt and link to them in my blogger site? @ov3r just expand your codes and find for same text you will get and replace it. ME GUSTA LA PLANTILLA ME FACINA, ME GUSTARIA QUE EN LA PAGINA PRINCIPAL EN LAS FOTOS DE MINIATURA SE VEA UN POQUITO MAS GRANDE, Y COMO PUEDO HACERLE PARA QUE LA PLANTILLA SE Extienda EN TODA LA PAGINA? o por otros valores mas grandes que guarden la proporcion de alto y ancho. Para buscar las variables en el texto HTML es mejor copiarlo al blog de notas y, despues, pegarlo al editor del contenido de la plantilla. Hi, I currently use this template and I was wondering how to change the colour of the font in the posts from grey to something darker. Do you know which piece of code I need to change? 7) Change Page Background Color and the font Text Color and not forgot to SAVE CHANGES. Now you can change colors when you want from Fonts and Colors. Si yo tengo inscrito una extensiÃ³n www, pero con formato blog, Â¿ Puedo aplicar esta plantilla? y Â¿CÃ³mo lo hago? Â¿Me pueden ayudar?? Please check your facebook account, I send you a message. Your template is awesome, thanks a lot. Hello. Can you tweak the code to allow the featured post and image to be automatically populated using an assigned label without having to manually add them one-by-one? Thanks. @briana sorry its possible in wordpress blogs with plugins not in blogger. is it possible to Add 3-Column Footer on this template?? can u help me? i have tried so many times, but it didnâ€™t work. @kpop use width of 700px and height is auto use any. @drag you can chek adam blog its fine now.Just u have to do is stop showing date of each post,You can find it in blogger design > Page elements > Hit edit button of blog posts widget and unchek date format. Btw, is there any possibility of showing the date of the post below its preview, near the hour? @drag ya do one thing.Just go to Settings > Formatting > Time stamp format. Now select its format as in form of date.Now date will appear at botton instaed of time as i dont think there is need of time of post. Could you tell me how can I put a navbar like this one (http://hybridnews-fbt.blogspot.com/) on your template? @drag which navbar u saying.i cant see any there. @drag ya its part of design only you can do anything with css yar.But i cant explain you as its not just simple unless u know css and designing. @drag sorry i cant say as u have been playing with template codes urself so not possible for me to tell as what mistake u would have been made. When I use portrait orientated images in the posts, they are stretched out and squeezed in on the main page, i guess to a size 64px by 46px. The landscape images are ok, but I could not find the settings in the code to fix the portraits. I guess using % to reduce their size would be ok, but I don't know where to find that line. Could someone help me out plz??? I got everything to work except the pages section. For some reason, when I click on one of my pages, it will take me to the page, however selecting read more, wont expand or open the full page. @vedtam find these codes and adjust the width and height. @jj ya pages wont work in this template sorry for it as template was made when blogger didnt released page features. Sorry one more thing. The links above i cant see.. but are there under links i guess.. if i scroll over it jus right i get a hand to click on it. buts cant see the actual link. is it due to the height? Thanks for replying…Yes I have found that code, but if i set the right size for the portraits than all he landscapes become squeezed in. Is there a way to resize them proportionally? Maybe if we just set the width and the height gets calculated automatically or to specify the amount of resizing in "%"? @JJ the widget from where u addded links , keep that widget title blank.You must have given title to that widget,remove it. JUst remove the title links of that widget. @vedtam no it can be set to get automatically adjust,its the drawback of this script.as it only resize to fix width and height given. But there is one more thing. In the Featured Posts header, would be nice to have for example the most recent 3 post automatically updated. I would try it to do but I don't know the variables you have used. Its ok, I think I can do it via feeds. I just needed a suggestion to start with, thanks. I have a really serious problem. On the blog I'm using your template (http://dazuis.blogspot.com/), there's a blank post between the main posts… How can I solve this? @drag oops i cant say i told u you altering codes disasterly so very difficult to sort out your problems. If I start working from zero, and do all the stuff I have now, is this problem begin again? @drag just see my demo in mozilla , chrome and Ie7 its all compatible to them.As they are only major browsers of today.In safari also will be fine as i think so. Anshul, it's me, Dragoes Azuis, but in my principal account. Is there any way of putting a background with a border on the comments in the posts? and me replied also u urself not rmeber where u commented. @drag me not able to get u what u saying. Is there any way of putting the links underlined by predefinitions, I mean, they are already of another colour, can I put them underlined editing anything in html? it is not sliding,can you suggest me some hints. @admin have told about all these problems several times in comments read them. bro …i hv some problem with this template…just see this …. ….and you can see the no. of posts shown are just 1 or sometimes 3 ….although i had choosen the blog post to about 6-10….can u give me some reasons about this default…. @PC ts now its auto in hand of blogger it will make clear. @sharlye i am not able to see any problem in your blog. Is the slideshow automatically updated when I publish a post? Hello, beautiful model, but when puts an image – link in the gadget, does she appear with a border, as I can remove the border or do you place her/it in the white color? Thankful. @manule no you have to do manually. The only problem is that on the resume hack when it say "posted on" it says the hour not the day of the publication. @sev just go to blogger settings > formatting > timestamp format chnage the hour format from there and select of date to show date. Im having some truble at the homepage, Each time i write a new entrie the number of entries decrease. But i already change thje config to 20 entries at the home page but stil decreasing. what can i do? @sev blogger has now done auto pagination acc to size of content on your home page. thanks anshull now i know how to fix it, you need to write <—more—> before the hevie content for made google think that you have a summarie and dont count soo much your entres and have the posibilitie of have more entries. now the only problem is how tho delete the read more link of google from the summarie. Thanks for sharing this theme! I switched to it from "The Latest" since it has more contrast. I'd like to know how I can change the justification on the Featured Content section. They're in the middle instead of the left. Also, I noticed that the summary posts are not aligned. is there a way to fix it? just LOOOOOVE this version, Anshul! Awesome, awesome, awesooome! @vi everything has been mentioned in installation and no such problem which has not been discussed in comments. After reading through the comments, I got to fix the alignment. Thanks! I just don't know how to justify the featured content text to the left. I've a bit of an issue. Starting today, some of the images aren't loading up fully on both homepage and individual posts. But if I click on the photo, it loads up the entire image. Any idea on how this can be fixed? thanks! @vi me seems no problem in it i chekd and please give me admin to do your chnages. I cannot get the featured posts to show up one at a time and slide to the next. Any suggestions? @rebecaa oh u nusing slider of mine only in your template i chkd your source . you are just missing the scripts of slider i think. Add them. thanks so much! I love your slider feature! For some reason, the words of the featured posts are hidden. The words were visible but now they're not. hi anshull, how can i change the publications text color to black?? thanks, but how can i change just the posts text color? Fantastic template by the way. I desgined my own, then added you feature content slider – which of course I'll give you credit for – but it only works in blogger preview, and not when I save the template and load the page???? have tried everything but no joy. Would appreciate the help, thanks so much. @cam ya i saw u r blog and slider seemed fine in my browser. I think u have added correctly if still there is problem, problem is in your browser. Update it to latest and chek then. Hi. Y really don't now how to show fine the pages. Did u update this template or how i can do it? sorry about my english, but i speak spanish. @mau ri ya template is updated if you will use this template the pages will show automatically in top menu links and pages also working fine now as in previous version was not working. There is a problem with the number of first page posts. Even if someone changes the first page's posts number, the template shows only 14 ! Any solution ? @dio as now its in hand of blogger read this will make u clear. hey buddy this one is a really good template. Ok i am having some problem. Like in the right sidebar the background color has been darkened, and also the image of your read more hack is now no more there. it was working fine till yesterday, could you please check it. the menu tab of the template is also lost now, also the image of the search box is not there..
Hey it says tinypic on the tabs on the top and on the search bar..like I can't see the image that was there before.. it just says tinypic as if the picture has been removed. yea it worked fine after a while. But this time, i guess your uploaded pics have been deleted. the search box and the images on the title bar is not there..and its showing TINYPIC. @ all ya just get those images and chnage links of images me updating it dont worry. @all i have updated image links..
how i can fix the search box and the images on the title bar, its showing TINYPIC? I saw your past comments, but i don't really know what i have to do. @mauricio just donwload the template and update it again. The blog I used with this theme was awesome, until today. I noticed that the menu had "tinypic" on the tabs. What could be the reason why it's doing that? @jewel just download the update the template xml again will get ok. Fantastic blog template, thank you very much for it! Quick question: I have forgotten how to adjust the front page to include all the text from extra-long post titles. I used to know how to do this, but then I uploaded the new template today and have forgotten! You can see the problem here: http://www.gamerlaw.co.uk/. remove height and overflow hidden css. thanks alot for chucky theme, that was so awesome theme ! !